Chael Sonnen, People’s Champion of the World, ups the trolling stakes with his new Punch Buddies Chael Sonnen I Want You Anderson Silva Shirt. 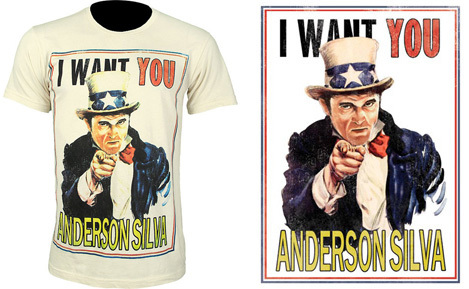 This Uncle Sam-esque poster-style shirt pretty much says it all, Chael Sonnen wants Anderson Silva once again. The Punch Buddies Chael Sonnen I Want You Anderson Silva Shirt is part of the Punch Buddies T-Shirt Series featuring fighters such as GSP, Stephan Bonnar, Rich Franklin and more. The Punch Buddies Chael Sonnen “I Want You Anderson Silva” Shirt is available at MMA Warehouse.